We call the fire engines, trucks and other emergency service vehicles we use "appliances". Currently we have a fleet of 784 vehicles in use throughout the State. These include tankers, urban pumpers, pumper/tankers, bulk water carriers, rescue and command vehicles. We aim to replace our appliances before the end of their 20th year in service. Since 2000, we have been replacing appliances with air-conditioned Crew Cab/Chassis. These Chassis provide a greater level of comfort for volunteers when travelling to and from incidents and during training exercises. This design gives the crew the opportunity to discuss strategies and tactics to use on arrival at the incident and for the Officer to give clear instructions to the crew. We look for continuous improvement on previous year’s models when specifying new appliances. Each year there may be some variations to the detail of appliances but the basic layout of the lockers and tray area has changed little in recent years. A vehicle designed primarily for firefighting, based on a 4x4 chassis. A vehicle designed primarily for urban responses including building fires, road crashes, hazardous material spillages, vehicle fires, etc. Usually on a 4x2 chassis and has the ability to carry a more diverse range of equipment. A combination of a pumper and a tanker. 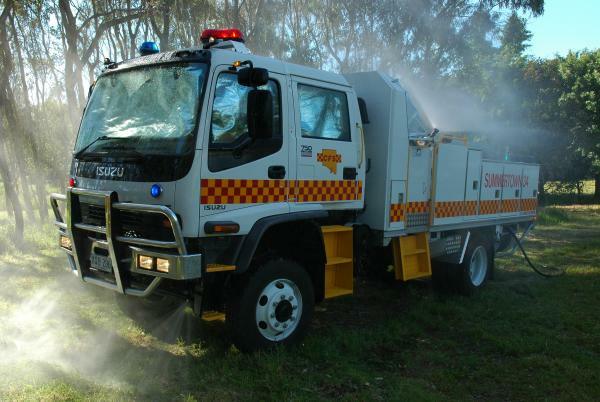 This type of appliance has equipment and pump performance to suit building fires, road crashes or hazardous material spillages, vehicle fires, etc., but also maintains off-road ability for rural firefighting. Based on a 4x4 chassis. A vehicle designed primarily for transport of large quantities of water and is used for replenishing water supplies on tankers at the fire ground. A vehicle designed primarily for use at road crash rescues and may also carry other types of rescue equipment. A vehicle designed for any other specific purpose not included above. This may include a specialist hazardous response vehicle or a mobile communications vehicle. Command Cars A 4x4 station wagon equipped with necessary communications, mapping and incident support material in order to undertake command, control or coordination functions. We operate in a continuous improvement environment. Our appliances have evolved over time and continue to do so. Increased hose reel length from 30 metres to 60 metres. In all cases, evolutionary improvements result in improved firefighter safety, either directly (crew protection systems) or indirectly (reduced firefighter fatigue). Type 34P deploying suppression sprays. The in-cabin thermal blinds can also be seen. We attempt to maintain an appliance age profile of 20 years maximum and replace appliances approaching or at this age. After we have decided on the chassis´ and pumps, we call for tenders for the construction of appliance bodies. We use a risk management approach to determine the number and type of appliances that we place in any given fire station. The CFS Standards of Fire and Emergency Cover (SFEC) outlines this approach. The SFEC prescribes a minimum level of volunteer staffing and equipment for each CFS Brigade. There is recognition that community situations change from time to time and therefore the SFEC incorporates a process that enables CFS Brigades to seek a variation to the SFEC Brigade Prescription. A variation to a Brigade´s prescription may result in an increase in the level of resources provided to that Brigade in order to support the effort to protect the community. SFEC variations must be approved by the CFS Strategic Leadership Group. Firefighters on the ground use aircraft and other aerial resources to help them fight bushfires. Firefighting aircraft, regardless of their size or type, do not extinguish a bushfire on their own. If you live in a bushfire-prone area, you need to have a well-prepared bushfire survival plan. You cannot rely on a fire tanker or firefighting aircraft to be available to protect and defend your home. Intelligence, Surveillance and Reconnaissance – gathering bushfire information (including mapping). Incident management teams may use this for planning purposes. They may also use it to develop public safety information and/or emergency warnings. Supervision and Command – coordination and control of firebombing aircraft. This includes implementing strategies and tactics and monitoring their effectiveness and efficiency. Firebombing – aerial delivery of water and aerial firefighting products to reduce a bushfire's intensity or slow its spread to support ground firefighting operations. Aerial Ignition – ignition of vegetation fuels (to assist back-burning or burning out operations) by dropping incendiary devices or materials from an aircraft. Crew Transport – transport of incident management, firefighting personnel and/or equipment by aircraft. Some conditions can limit the effectiveness of aerial firefighting operations. Aircraft operate more efficiently in denser air. As temperature increases, air density decreases. This has a dramatic effect on aircraft performance. On very hot days, aircraft may need to reduce their load capacities in order to operate safely. High air temperatures and low relative humidity will also reduce the overall effectiveness of firebombing operations on the ground as water content rapidly evaporates. High-speed winds can reduce the effectiveness of firebombing operations. If wind conditions are severe enough, we will suspend aerial firefighting operations until conditions improve. All aerial firefighting operations are conducted according to Civil Aviation Regulations of Visual Flight Rules (VFR). This means the pilot must be able to see to avoid terrain and other aircraft, and to navigate by visual references. We may suspend aircraft operations in low visibility conditions until conditions improve and pilots are able to operate under VFR regulations. Low visibility may also reduce the effectiveness of firebombing operations as targets and hazards in the fire area become obscured or undetectable. This makes conditions unsafe for aircraft to operate. Reduced visibility from fog, dust, smoke or cloud may also restrict aircraft from taking off and landing at an airbase. Civil Aviation Regulations do not allow firebombing operations at night. All VFR operations must commence and conclude between first and last light. For additional safety, CFS Standard Operating Procedures require all aircraft to be "on the ground" 30 minutes prior to last light, ensuring adequate time to safely return to an appropriate airbase. Firebombing operations are only effective if followed up with intense firefighting activities by ground firefighting crews. The main objectives of firebombing are to knockdown a fire edge, slow or halt its rate of spread, long enough for ground crews to access the fire line and mop up or supplement the knockdown process. If ground crews cannot get to the fire edge due to terrain or access, then the fire will rekindle over time. Where obstructions do exist, the pilot in command will undertake a dynamic risk assessment before the aircraft is committed. In some circumstances, aircraft will not be utilised because risks caused by vertical obstructions exceed safe operating conditions. Our aerial firefighting fleet includes 17 contracted aircraft. We do not own any of the aircraft in our aerial firefighting fleet. We contract aircraft for exclusive use service periods during the Fire Danger Season. International organisations have found that owning and operating aircraft is not economical, particularly when the aircraft are used on a seasonal basis (approx. 5 months of the year). Contracting aircraft over short periods (generally 3-5 years) allows us to be flexible with the selection, composition and placement of aircraft within our fleet. We can also embrace new aerial firefighting technologies and maximise financial resources. This gives us an adaptable fleet of aircraft that are suited to a diverse range of fire conditions. The AT-802 fits all of these criteria. It is the largest single engine firefighting air tanker in the world today. This aircraft is a modern, turboprop initial attack air tanker that is fast, manoeuvrable and cost-effective. It perfectly complements our rapid initial attack philosophy. For more information on the operational capabilities of the AT-802 aircraft, read the Single Engine Air Tanker Fact Sheet. While helicopters can be slower to deploy than other firebombing aircraft, the Erickson Air-crane brings a number of unique benefits to the fire ground. The Erickson Air-crane S-64E is a heavy vertical lift helicopter capable of delivering high volumes of water and suppressant to a bushfire, provided it can access an appropriate water source such as a large dam, lake, or reservoir. For more information on the operational capabilities of the Erickson Air-crane S-64E aircraft, read the Type 1 (High Volume) Helicopter Fact Sheet. Since the devastating Wangary fire on Eyre Peninsula and the Black Saturday fires in Victoria, timely and accurate community information on the status of bushfires has become much more important. Surveillance aircraft play an important support role in gathering information needed for us to provide safety information and emergency warnings to the public. These aircraft also play an important role in the safe and efficient command and coordination (Air Attack Supervision) of firebombing operations. 2 x AS350BA Squirrels helicopters. provide welfare support to pilots and other aerial firefighting personnel. All firebombing aircraft in the CFS fleet have the ability to drop water with aerial firefighting product additives. We use a range of approved and commercially available products in each of the 3 classes. Fire suppressant foams are a combination of wetting, foaming and surfactant agents (commonly used in shampoos and detergents), added to water. This improves its effectiveness through increased retention on vegetation fuel surfaces and reduced evaporation. We use foam to "knock down" a fire’s intensity to allow ground resources access to the fire edge. Water enhancers, often referred to as gels, increase the viscosity, adherence ability, cooling time and wetting capability of water dropped onto vegetation by aircraft. These products can also improve firebombing drop accuracy through reduced wind drift. We use water enhancers as an alternative to foam for direct attack to knock down a fire. They are particularly effective in scrub or forest vegetation. Long-term retardants contain mineral salts that inhibit the vegetation's ability to ignite. They are designed to place on fuels ahead of a fire to stop or reduce the fire from spreading. Retardants remain effective even after the water in the mixture has evaporated. They are ineffective if a fire is spotting. The red colouring in the product is an iron oxide colorant. It allows pilots to see drops on vegetation from the air. It will eventually wash away after rain or break down over time with UV light exposure. View additional information on Aerial Firefighting Products. "… in order for aircraft to provide effective assistance, they must be available at call, rapidly dispatched with minimal travel, and with logistical systems in place". Since the mid-1990s, we have established procedures for the safe and efficient response of aerial firefighting resources to bushfires. These are based on an aggressive rapid initial attack strategy. Under this strategy, we have set up specific Primary Response Zones (PRZs) across South Australia. PRZs are geographical areas where uncontrolled grass or bushfires may have serious consequences on life, community property, critical infrastructure, environmental or commercial assets. The size of PRZs are generally based on distances of no greater than a 50km radius from a nominated airbase, and flight times of less than 15 minutes to ensure initial attack success. provision of early and timely advice to the public. Aircraft on active standby are dispatched to any reported rural fire in PRZs. At the same time, we dispatch the nearest CFS brigade. The standard aircraft response is 2 Single Engine Air Tankers (SEATs), and 2 surveillance aircraft. The initial dispatch of aircraft can be supported with the response of additional firebombing aircraft if required. All areas outside of defined PRZs are considered part of the state's Secondary Response Zone (SRZ). The primary function of aerial firefighting aircraft in the SRZ is to aid ground resources to contain larger fires and/or protect specific assets, and provide accurate and timely advice to the public. Aerial firefighting aircraft are not strategically located in this zone for rapid initial attack. The aircraft respond based on a specific request by an Incident Controller and approved at a state level. We may pre-position aircraft in these areas based on exceptional predicted weather conditions in order to reduce response times. Firebombing is a demanding task for pilots. Pilots have to fly at low-level in reduced visibility and near other firefighting aircraft. If non-firefighting aircraft enter a bushfire area this makes their task more dangerous. Air Services Australia (ASA) issues a Notice to Airmen (NOTAM) annually to alert pilots to the safety issues associated with bushfires and the presence of aerial firefighting aircraft. The NOTAM requires all aircraft that are not coordinated through the relevant state fire authority to remain clear of observed fires for a distance of 5 nautical miles and altitude of 3 000ft above ground level. Pilots are responsible for obtaining NOTAM information. This is available on the Air Services Australia website. Ownership of recreational remote piloted aircraft (RPA) or drones has increased over recent years. A small drone colliding with the tail rotor or engine intake of a helicopter or propeller of a fixed wing aircraft could cause the aircraft to crash. If you operate a drone, you must comply with regulations, whether you are flying them for recreation or commercial purposes. If we detect a drone operating near a fire, we may suspend aerial firefighting operations until we consider it safe to resume. If we suspend aerial firefighting operations, we will instigate an immediate media alert to ask the operator to stop, or members of the community aware of the operator, to contact police.